One of the few problems I’ve noticed is how horrible the cavalry is. The hit box should be increased a ton. I have brushed people with my sword too many times. I think that the cavalry should owe up to badassery (it can literally take on a tank). The cavalry IS buffed! A headshot with a bolt action rifle used to do 80 damage on a mounted horseman, 100 if it was in the sweet spot, it’s now 14 damage. And they can heal themselves and the horse, without the finicky process of dropping a med pouch and trying to pick it up, like it used to be. The 1895 Cavalry is a two hit kill weapon up to 90 meters now, and a one hit kill headshot up to 84 meters. I wouldn’t mind a few more choices regarding sidearm, or even the ability to apply weapon skins, but the Cavalry is in a better place now, than in a long time. You know a vehicle class is under powered when it is always available. One does not see tank or plane slots being unused for the majority of a round but cavalry slots is almost always there if one feel a sudden urge to go for a ride. As they are now, it would be better if you just spawned in as regular on the horse so that you use it for transportation only, like a WW1 quad bike. Not necessarily under powered, but it requires some practice to be effective as Cavalry. You have to either be really close range to get kills with the sword/lance, which makes you vulnerable to enemy fire, or you have to be good at aiming with the rifle. If you stand still, it’s easier to shoot, but it also makes you an easier target. If you are on the move, though, it makes it a lot harder to hit your shots. Compare this to a tank, where even a completely new player can roughly aim in the enemy direction, and get kills because of the splash damage. It’s just easier to pick up. The Cavalry was neglected for very long, and it got some nerfs, which may have turned people away from it. If so, I’d recommend to try it out again, it got a lot more viable, in the latest patch. @Ploodovic I use the class still now and then and I can get kills with it (my top two weapons are the saber and cavalry rifle). I was just stating a general fact that it obviously is not seen as a real asset for a team by most players. Sure, some players can use it and do good but they are scarce and even those mostly do even better as regular infantry. Even planes that actually take a bit of time to learn are rarely ignored the way the cavalry slot is nowdays. Head3masher and Hawxxeye: Having the vehicle class weapons for cavalry, I think should have been a given from the start. First, it is regarded a vehicle and second, it would be a much easier way for us service star collectors to get stars on the vehicle class weapons as bailing a full health horse is quite ok whereas doing that from plane or tank is not that good. All I want is a buff in the sword and lance. The reach is so short that it would be more optimal to just run them over with the horse. It want to bring back the **** moments a skilled player can have when taking down a full squad, and if lucky enough, a tank. I also want to hear that crisp sound of a sword kill, and the feeling it gave me. I (loosely) consider myself a fellow rider but what you are describing is a wrecking machine. The med buff has considerably increased the cavalry's ability to stay alive longer and while it might seem a bit overdone it is in the right direction. In my eyes cavalry only needs more weapon variety to chose from. Agreed. It should take way more than 30 rounds of the IMG 08 to knock a guy off his horse. Screw that. Let them have Elite class weapons. I don't know...Villar or the Raider Club be good choice. I think he means sarcasm class weapons. The med buff should be decreased. A horse isn’t made out of steel. And I don’t think the health buff should compensate for the reach and hit box of the cavalry sword/ lance. I'm actually pretty satisfied with the health buff to Cav. Being able to heal yourself and Callus gives you a lot more wiggle room to work with. You can escape and top off no problem. Been using the rifle+nades a lot more. Most players still seem to be under the impression that Cav is an easy target to 1v1. They don't realize that when I broke line of sight for 10-15 seconds, it was to drop a pack and heal back 65 of the damage they laid on me before I swing back around. They stand there motionless, doing small damage, letting me aim in my careful shot thru their face. I think the days of using the Sabre/Lance very much is over and done with tho. I still feel the hitbox for them is too wonky and inconsistent anymore. It is already buffed and i am in top 100 with cavalry trust me.. The cavalry has already been buffed, it needs to be nerfed honestly. People who stay on horses or tanks ALL match shouldn't be catered too. It's the easy way out. It is the most unused vehicle on console. I can understand why pc users would think it’s great. Aiming is known to be easier on keyboard and mouse. But it’s easier for console users to go straight into action with sword/lance. Which is basically the only option we have. 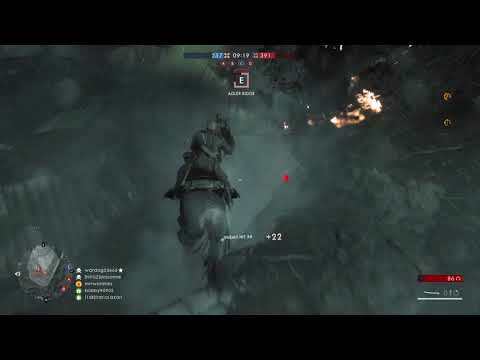 Cavalry is still fun and effective and if used wisely can still rack up some kills. Are you crazy? Cavalry NEEDS a buff.